UWP – now slightly less Universal than before! 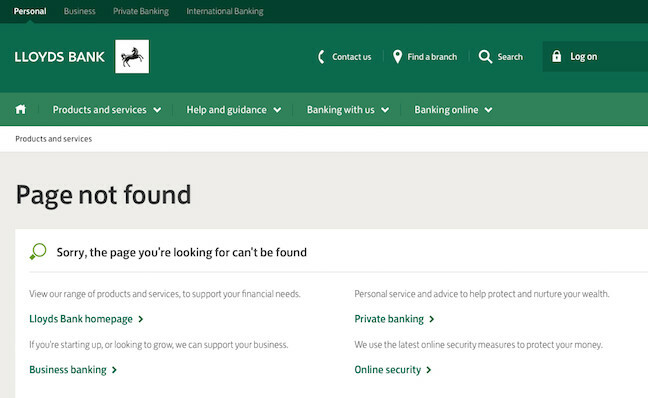 The UK's largest retail bank, Lloyds, has withdrawn its app from the Windows Store, and the bank's web page now redirects to a 404. TSB's Windows mobile app has also disappeared. Although the Windows Store has mobile apps for Barclays and RBS's NatWest – both have around 18 per cent market share – Lloyds is far and away the market leader for individual current accounts. Satander and HSBC have a combined share of 22 per cent. Totting up the numbers, we reckon that leaves two-thirds of British current account holders stranded. Chatbots and nerd goggles get all the love at Microsoft these days, not phones. Although there's a case for killing off the mobile platform completely, it lives on as an afterthought. But this raises the question – what does the "U" in "Universal Windows Platform" actually stand for? Microsoft's strategy is designed to create portable apps that run across its different platforms, but the number of platforms is effectively diminishing. In reality, it's Windows on Intel... and Xbox. "We're going to continue to invest in ARM and cellular," Terry Myerson, executive vice president of the Windows and Devices Group at Microsoft, told Mary Jo Foley recently. "And while I'm not saying what type of device, I think we'll see devices there, Windows devices, that use ARM chips. I think we'll see devices that have cellular connectivity".